LAFLECHE CU SHARES PROFITS WITH MEMBERS! The Board of Directors have approved to issue a Patronage payment totaling $350,000 to eligible members. The payment is based on a 12% rebate of eligible loan and LOC interest paid, and a 12% bonus on eligible deposit interest received by members (excluding registered products). 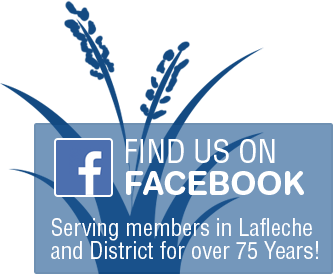 Over the past 20 years Lafleche Credit Union has returned close to $3 million to members to recognize their loyalty and support. 50% of this year’s rebate will be credited to Member Equity and the other 50% will be automatically deposited to member accounts.